She wore white—a cotton t-shirt and jeans cut off at the knees. I’d been told not to wash my hair with shampoo, not to use hairspray or cosmetics, not to wear perfume—nothing with a scent. 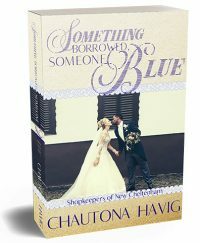 I felt ugly sitting there in the sweats and a t-shirt she’d left waiting for me in her garage—with my hair washed and hanging in my face. No makeup. Just the plain, normal me. She asked me a lot of questions that day—encouraged me in many ways. I’d picked up the deplorable habit of saying “god” in a rather irreverent and dishonoring way. She didn’t admonish me with Scripture. I think she knew that I needed anything but to be whipped with the Word right then. I wonder if she ever knew how it affected me. I’d been reproved about various things in my life—often. By friends, family, those in the church.It’s part of a young person’s growth, I suppose. And though, like anyone, I never liked it, I didn’t object to it in principle. On the other hand, I remember being at another woman’s house a few years before that. They did things differently than my family did. Sometimes when I was there, I talked about it with her—compared the differences. Look, I don’t want to pretend I that I couldn’t have sounded like an insufferable know-it-all. No, I’ve no doubt that I did. At twelve, you are still learning how to be tactful. They crushed me. 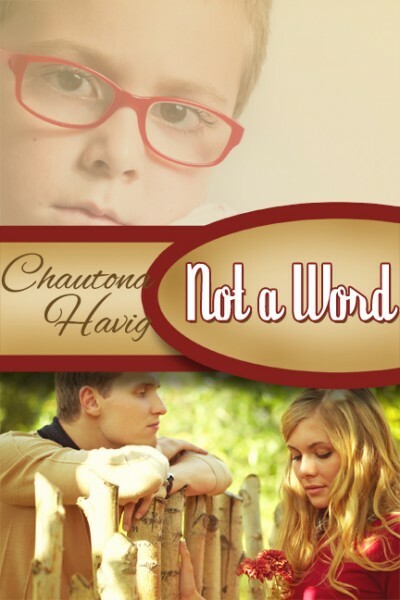 No adult had ever deliberately spoken unkind words to me—words intended to wound. Yep. She lost the chance to teach a girl hungry to learn. If she’d just said, “Do you realize you sound critical?” If she’d just said that, I would have been mortified—but in a good way. I would have apologized. I would have asked how I could learn without being offensive. But she didn’t do it. She only ensured that, no matter how much I wanted and needed to learn, I’d never ask her. And you know, not because my pride was hurt, although I would have assumed that as a girl. No, it would have been because you can’t trust someone who will lash out at you like that. She had much to teach me, but not the lessons I think she would have preferred to teach. You see, from her, I learned why it’s important to be patient with youth. And, in a twist of irony, I’m fairly certain that without her, I would have been even more naturally impatient than I am today. From her, I learned forbearance with those who are unkind. From her I learned what kind of person I didn’t want to be, how I didn’t want to respond to annoying people, how inquisitive chatterboxes can annoy people—so when I had half a dozen of my own, I’d be a little more understanding. Instead, a woman housebound in a scent-free bubble showed graciousness and that made me want to learn them—to emulate her in that way. One single day with a woman I never saw before or again—it changed my life. Just a piece of it, sure. But it definitely changed it. She didn’t set out to be a mentor, I’m sure. She just wanted to encourage a young girl who was lost and alone, trying to understand what the Lord was doing in her life. But one day, with one kind sentence—she became a mentor whose only “session” with me never left my mind or heart. They both taught me from Ephesians 4;32, to be precise. Unlikely mentors… both of them godly, beautiful women. No, really they were. One couldn’t handle the harsh, artificial scents of the modern world–they’d kill her. But her gentle spirit, her loving acceptance, her kind and gracious reproof–no lovelier perfume has ever sent its way heavenward. As for the other woman, well, her lessons never left me, either. I’m sure I sound unforgiving, but I’m not. I promise. But I’ve kept the day—and several similar instances with that woman—in my mind over the years because I knew how easy it would be to become just like her in situations like those. And maybe some future girl who received my impatient, snappish, ugly retort would get it on the one day she couldn’t see past it. Maybe it would be that one last thing that sent her running far enough away from Jesus that she couldn’t hear that soft, tender call for my harsh, strident tones echoing in her mind and heart. I don’t want to be that person. I just don’t. They say a mentor is someone who “disciples” you over a long expanse of time. Both of these women did, although I haven’t seen either of them in thirty years. 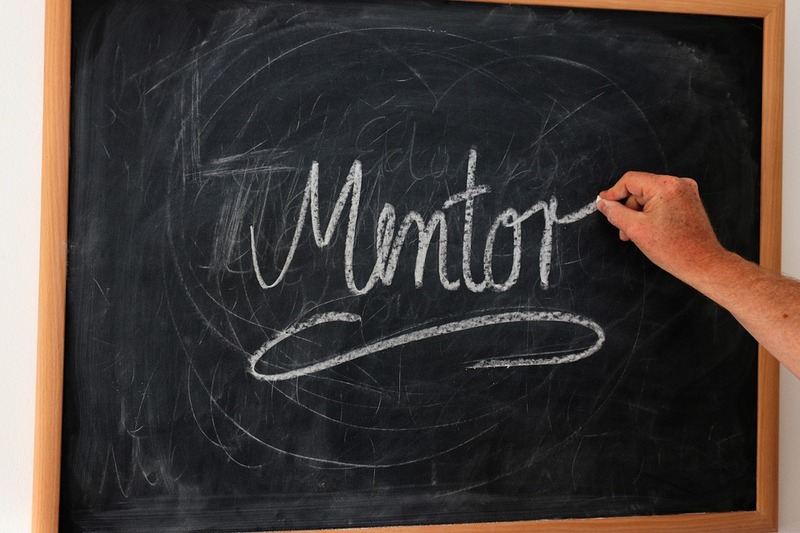 How did some unlikely “mentor” make a difference in your life? I decided that I needed an infusion of Ephesians 4:32 in my life, so I’ve created a coloring page in both NAS and KJV. 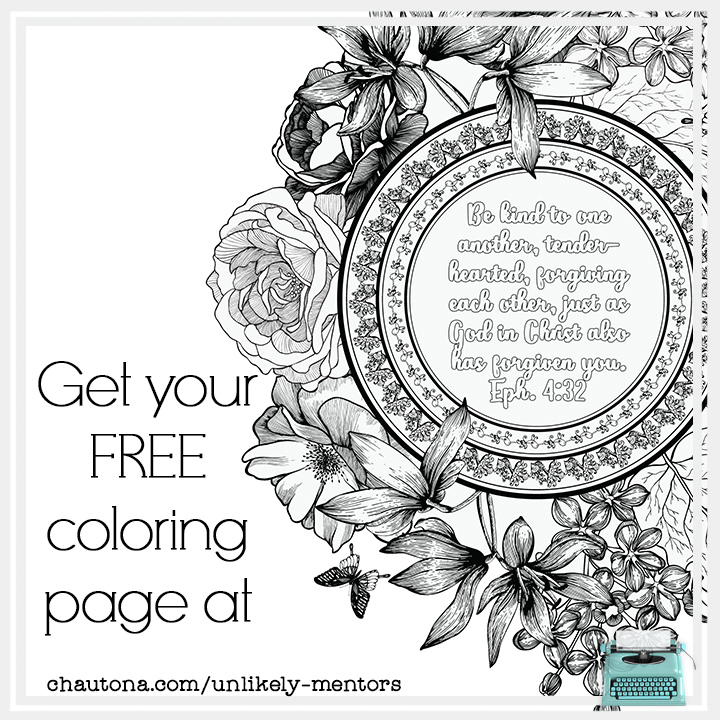 To get your free coloring page, just leave a comment (about unlikely mentors and your version preference), and I’ll email it! To get my other coloring pages, click the image above or go HERE. YES! I learned so much from people who just LISTENED. It taught me to listen, HOW to listen, and how valued people feel when someone LISTENS. Great reminder! My whole life I’ve viewed this verse from the side of the one needing to forgive. Today reading this I read the scripture from the eyes of one needing forgiveness. Ironically I never much liked it when I read it as one who had to give the forgiveness…but to see it from a person who should be trying not to be “snarky” because then you’d need forgiveness – it feels much like the easier yoke. Many a “church lady” has broken the spirit of a young child (or mom trying her best) but like you said – I don’t ever want to be the one who says the harsh word. It’s hard… it is. But it’s so worth it. We mean well, and we crush one another. And it’s hard. It’s so hard. That is just beautiful! Love it. Wow! How I want to always provide a soft answer but, too often lately, seem too quick to judge. You have given me some things to think about, pray about, examine. Thank you. I really learned a lot from both women. And the “harsh” one is a beautiful, godly woman. I doubt she ever knew that she managed to penetrate my rather tough skin. At 12, there are spots that are a bit thin still. Hee hee. And, frankly, I’m glad I was where I was in my life then because I learned from it rather than became bitter or learned the WRONG lesson in how to handle pesky kids who are figuring out this thing called life. When I was a young Christian (early 30s) I had two friends who taught me much. One was my age and impressed me by her gentle corrections with her young daughters. She never lectured or yelled and usually only answered them with a question like “what do you think their response will be to that?”. Since I had(ve) a propensity to give people my answer to the question and not inspire them to look for their own, this has often come back to me again and again. The other was an older woman, then in her 60s (as I am now) and she was to me the embodiment of the “older women teach the younger how to love their husbands). She was married to a somewhat difficult man but I never heard her complain or criticize him. What a wonderful illustration of how words can tear down or build up. Thank you for sharing. I’ve been thinking of it for months. Decided it was time to share. Sometimes it takes so little to leave a lasting impression!! When I was probably only 8 years old there was a teenage girl who would come to church with her boyfriend. They were among many young couples at church but what always stood out to me is that she always looked me in the eye and smiled. None of the rest ever paid any attention. She was shy and quiet and never talked to me. But her smile left a lasting affect on me and really even on my 4 daughters. Because it has been very important to me to teach my daughters to reach out to younger girls too. YES! One small little thing can be a big thing to someone else. I’ll never forget learning just how horribly servers are treated when a young server nearly cried that we weren’t going to yell at her for not bringing out the corn with the meal (it wasn’t done and she wanted us to have hot food. SILLY HER!) I was blown away that she was even nervous! Can’t for the life of me think of a mentor, unlikely or not, because your words struck a nerve. I am left wondering if I’m guilty of reacting like the second one, and praying NOT. Wow…convicting….